It has gotten pretty warm over here and my mind is already in summer mode. When you think of summer vacation, what comes to mind? A national park, a road trip, or maybe the beach? For me two places remind me of my childhood summers: a working farm in Bavaria or the Adriatic coast. 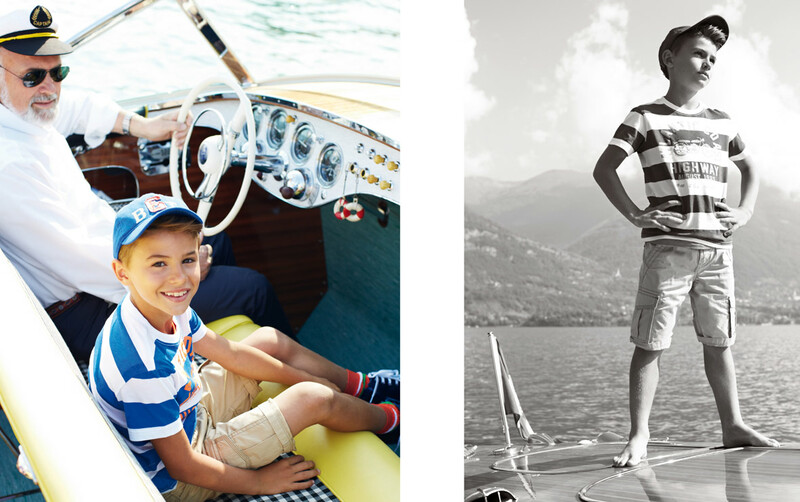 The Italian company Benetton picked a lake location for their summer shoot. I imagine this lake is somewhere in Italy or Switzerland. Anyway it transported me back to my cousin’s husband taking me out on a similar boat once when I was the same age as these kids. It felt pretty special. Benetton is known for their bright, fun colors. I would like the blue striped shirt for my 10 year old son. The embroidered sleeveless top with the turquoise skirt is darling. You can find last year’s spring collection here.